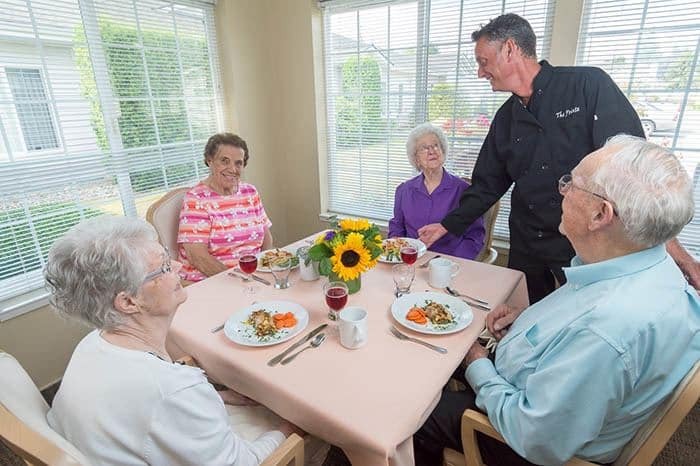 At Barnett Woods we appreciate that a nutritious diet of choice is one of the most valued aspects of a senior’s life. We believe that a fine dining experience begins with fresh, house-made specialties using the best ingredients. Residents and guests may enjoy a restaurant-style dining experience created and served by a friendly and passionate staff. We provide tasty and well-balanced meal options throughout the day. At Barnett Woods we value a fine dining experience, three meals a day! We serve breakfast from 7:30am to 9:00am, lunch from 11:30am to 1:00pm, and dinner from 4:30pm to 6:00pm. Enjoy ordering from a selection of special menu items developed by our chef or our alternative menu options offered daily. Each day we serve a chef’s choice soup, salad selection, deli sandwiches, and more. To add to your fine dining experience, one evening each week our dining room also boasts live entertainment by a local pianist. Call or contact us to see what is cooking in our community this week! 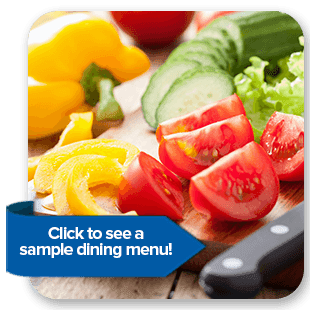 Tour our community and enjoy lunch or dinner on us!